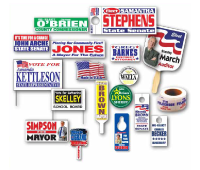 Need Stickers, Decals, Magnets or Small Signs, take a look through our On-Line Catalog. Tradeshow or business expo coming up soon? Need stuff with your logo on it? We can help. Browse our of hundreds of promotional products for pricing and more information, or contact us for a custom quote. If you need something a bit more impressive for your next event, contact us about creating pop-up banners and tradeshow displays.